Jeremy Renner Is Getting a Hawkeye Spinoff, But Only As a TV ShowIt’s being described as a limited series. Jeremy Renner Joins Todd McFarlane’s Spawn Movie Alongside Jamie FoxxThe comics creator has long said he wants his directorial debut from Blumhouse to be more akin to a horror movie than a superhero flick. 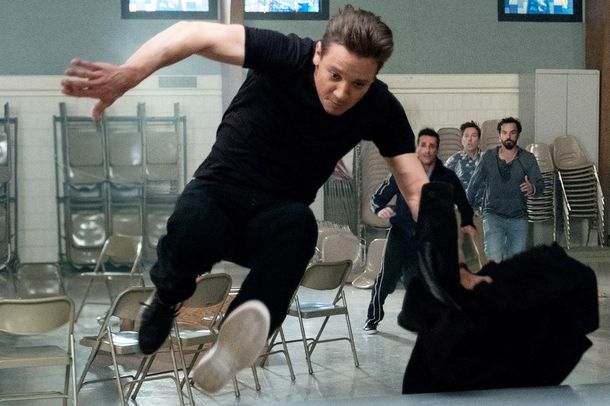 How Obvious Are Jeremy Renner’s Broken Arms in Tag?A Vulture investigation. Jeremy Renner Literally Just Fell on His ArmsThe saga of the summer. Jeremy Renner Says His CGI Arms Only Show Up for One Scene in TagCan you spot it? Wind River Severs Ties With Weinstein Company Ahead of Awards SeasonLeap and Tulip Fever will also remove the Weinstein Company’s name from their home-video releases. Breaking News: Jeremy Renner Is Grumpy Cat’s DoppelgängerMeow. Elizabeth Olsen’s Guide to Screen Chemistry With Renner, Plaza, and BettanyThe star divulges the secret to her sparks with Jeremy Renner, Aubrey Plaza, and Paul Bettany. Watch Elizabeth Olsen Try to Solve a Murder in This Wind River ClipThe new film from director Taylor Sheridan also stars Jeremy Renner. Jeremy Renner Says Arm Injuries Won’t Effect His Other Jobs, MostlyJeremy Renner is going to be fine, says Jeremy Renner. Elizabeth Olsen’s Sage Advice From Jeremy RennerRenner has been around the block a few times. New Arrival Trailer: Are You There Aliens? It’s Me, Amy Adams Arriving November 11. Jeremy Renner Simply Will Not Take Off His CoatIt’s a nice coat. Jeremy Renner Wanted Hawkeye to Die in AvengersDozens of Hawkeye fans would be devastated. Jeremy Renner Is Hollywood’s Greatest Negotiating Tool (But He Deserves Better)Somebody needs to figure out what to do with Jeremy Renner. The Avengers Played ‘Musical Beers’ With Jimmy Fallon, and Guess Who WonIt’s like musical chairs, but with booze. Renner: Hollywood Lacks ‘Badass Female’ RolesIs that you? Marvel, Please Give Jeremy Renner More to DoRenner is definitely interested in a Hawkeye Netflix series. Anne Hathaway, Jeremy Renner Set to Host SNLWatch out, Katie Holmes. Pacino, Renner, Moore to Star in ImagineA project written and directed by the guy behind Crazy, Stupid, Love. Christian Bale Returns to David O. Russell FBI and Con Artists FilmHe joins Jeremy Renner, Amy Adams, and Bradley Cooper. Why the Hansel and Gretel Trailer Is So AnnoyingIt’s like an unintentional supercut of everything bad from last summer’s movies. See the Hansel and Gretel: Witch Hunters TrailerWith guns. Watch an Avengers Gag ReelEven Jeremy Renner — Jeremy Renner! — cuts loose. Really! Jeremy Renner Does Not Fear Julian Assange’s HairAnd talks Bourne. Jeremy Renner May Play Julian AssangeIn a film that Bill Condon would direct. Watch a Clip From The Bourne LegacyJeremy Renner, show us your stuff. Jeremy Renner Joins David O. Russell’s American BullshitHe’s taking Christian Bale’s place. Today in Vulture Recommends: Five Earlier Exploits of the Avengers CastWhat happened before the Avengers assembled? A whole lot of character acting. Which Other Avengers Should Head to Broadway?Scarlett Johannson and Jeremy Renner are heading to the Great White Way. Who else should follow? Scarlett Johansson, Jeremy Renner Near Cat on a Hot Tin RoofThey’re close to signing on for a Broadway revival. The Loneliness of Jeremy RennerYour new Bourne star gets existential. Portman, Bardem, Renner Wooed for CounselorIt’s Ridley Scott’s movie with Michael Fassbender starring. The Bourne Legacy Trailer: Jeremy Renner Gets RecruitedCan he take over Matt Damon’s action franchise? Movie Review: The Nonsensical, Wonderful Mission Impossible: Ghost ProtocolIt’s surprising, even moving, how often Cruise throws the ball to Renner. Last Night on Late Night: Charlize Theron Threatened to Slap David LettermanPlus: Jeremy Renner’s papa’s still pimpin’, and more, on our daily late-night roundup. Full Mission: Impossible — Ghost Protocol Trailer: Cruise vs. Renner vs. GravityAlso: sand and explosions and Josh Holloway. Mission: Impossible — Ghost Protocol Trailer: Do You Choose to Accept Tom Cruise?And Jeremy Renner is there, too. Jeremy Renner and J.Lo Join Ice Age 4J.Lo plays a tiger, duh. How Jeremy Renner Landed the Bourne FranchiseCompromise, compromise, compromise.